Om Vishnupad 108 Tridandi Swami Sri Srimat Bhakti Sravan Tirtha Goswami Maharaj ki Jai ! King Vrishabhanu was a great devotee of the Divine Mother. One day Sri Radha devi graced him with Her transcendental apparition and told him that she would descend as his daughter on the earth near the village "Ravali'. Overjoyed, the king his wife and other companions reached the village from Vrishbhanupur (Barsana). On the 7th day before full moon in the month of Bhadrapada, in the early hours when it appeared. that the entire land was suffused with a golden glow all around Sri Radha Parameshwari descended upon the Earth as a two year girl child. At that time dried-up trees turned green, stones started emitting melodious notes, the dumb began to talk and the lame climbed hills. All of nature displayed ecstatic symptoms by the influence of the Ahaladini Shakti (the pleasure potency). Coming to know of the descent of Sri Radharani, the celestial sage Narada went to Barsana and requested Vrishabhanu to give him an opportunity to see the divine child. The king prostrated before the sage and said "Maharshi, due to my good deeds in the past, I am blessed with the presence of Laadli Radharani in my House." Narada saw the divine child and prostrated before Her golden cradle. By the grace of Sri Radha Narada was immersed in bhava samadhi (state of divine rapture). The great sage extolled Sri Radhaji in beautiful verse. Oh! Parameswari! You are the 'Sandhini Shakthi' latent in the 'Sachidananda Swaroop' (Lord Krishna). Oh! The enchantress of Krishna. Oh! Rasa Swaroopini, you are the embodiment of Yoga Shakti. You are the controller of 'Maya' You are an ocean of 'Rasa'. Your vision always remains inward. From your majestic tranquil face, inexplicable light of divine ecstasy is emerging. Oh! Mother! Brahma, Rudra and the like cannot comprehend your Tatva (transcendental nature). You do not appear even in the meditation of great yogis. You are the origin of Icha (desire), Gnana (knowledge) and Kriya (ction) shaktis. Oh Mother! All divine incarnations appear from your energy. Oh! Janani! I desire to behold that beautiful divine eternally youthful form which is worshipped by Lord Sri Krishna Himself. 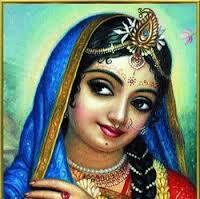 At that very moment a most enchanting and resplendent form of Kishori Radharani appeared before Naradaji. Beholding the transcendental effulgence of Sri Radha, the Devrishi became unconscious. Radhaji's sakhis awoke him by giving the charanamrita (water used for feet-washing) of Radhaji and they said "Oh! Narada what you have seen is the unique and rare form of Sriji that is worshipped by Sri Krishna." Narada your good fortune has no parallel. Even great gods like Brahma, Rudra, did not have the darshan of this form of Sri Kishori. She is going to disappear soon. Prostrate before Her immediately," advised the sakhis. Narada fell flat at Her feet. The Mother of all Creation disappeared even as he looked on. Mahamaya divides and distances the Jeeva (individual soul) from God and Yogamaya brings him close to the Lord and unite with Him. Maya is one of the shaktis of Radharani. Captivated by Her Love I always roam with Her. Know Her as the Supreme Goddess Radha - the embodiment of Supreme Love. Oh Maheswara, that Jeeva who is devoted to me without having devotional sentiment for Sri Radha cannot attain me. So with all your effort surrender unto Sri Radha, worship Her and It will captivate me. Oh! 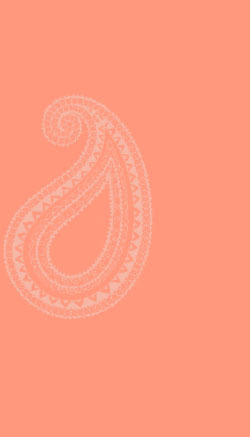 Mahadeva:I have given you a great divine secret. You should conceal it consciously. Tvamapyetam samasritya Radhikam mamavallabham japanme yugalam mantra sadatishta.. Taking shelter at the lotus feet of Sri Rahda, meditate on my 'Yugal manthra! (The 'Mantra' of Radha Krishna) Then Sri Krishna gave the maha mantra to Lord Shiva. Resplendent in pure golden colour she lights up all directions with Her lightning like luminescence. She is pradhana (primordial energy). She is pervasive throughout it. She is its creator, sustainer and the destroyer. She is 'Vidya'. She is Veda Vidya as well. She is Chinmaya Roopini (embodiment of the conscious principle). She is Yoga Shakthi and Maya Roopini as well. She is the cause of existence of Brahma,Vishnu and Shiva. She is Chinmaya Roopini (embodiment of ChitShakthi). She is Yoga Shakti and Maya Roopini as well. She is the cause of existence of Brahma,Vishnu and Shiva. Tamalingyam vasantam tam muda Brindavaneswaram. I embrace Her in ecstasy, know that I am Vrindavaneswar. Srimati Radharani is mentioned in many Puranas like the Padma, Skanda, Narada, Brahmanda, Brahmavaivarta, Matsya, Shiva Puranas as well as the Devi Bhagavatam. In the Skanda Purana , Vaishnava Khanda, Bhagavata Mahatmya talks about Srimati Radharani. The 1st chapter (Volume 6) contains the famous statement, “Atma Tu Radhika Tasya” – Radharani is Krsna’s soul. The Vasudeva Mahatmya (Volume 7), Chapters 16 and 17 describe Goloka and the manifestation of Radha Krishna for Narada. As regards the Srimad Bhagavatam, it is said that Sukdeva Goswami, who recited the Bhagavatam, was a pure devotee of Radha Krishna and so uttering their pastimes would have caused him to lose his consciousness so he indirectly referred to Sri Radharani using words such as ‘Kaachit’ (One Girl), ‘Saa Vadhuh’ (That Bride (of Krsna)), and ‘Priya’, (Beloved). The highest representation of love is found in Sri Radha. It is actually She who bestows divine love in the heart of the devotee. Therefore She is the Guru of the guru.